On the way to where we would catch the ferry to Clare Island, we stopped at another craft shop. 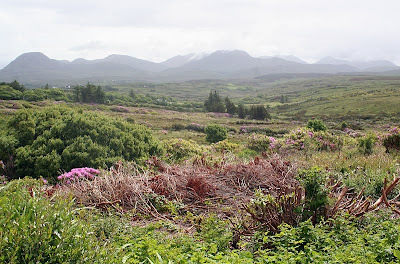 From its car-park we had this superb view of the Connemara Mountains. At this point I noticed that my camera's battery was losing its charge. I'd fully charged it before leaving home, so I hadn't brought the charger with me. This meant that I would not be taking many more photo's. The craft shop had a very large display of woolen garments, and the brands and names of producers was becoming familiar. This was one of the few shops that included a small gallery for paintings. They seemed quite expensive. I'm not sure whether or not the work sells, but I noticed on subsequent occasions that high prices were asked for very average work. I settled for a tin whistle in anticipation that I might play it later for the forthcoming fashion show on Clare Island. We continued our journey to the south side of Ireland's longest sea loch, Killary Harbour, a fjord that had a number of salmon farms scattered along its considerable length. 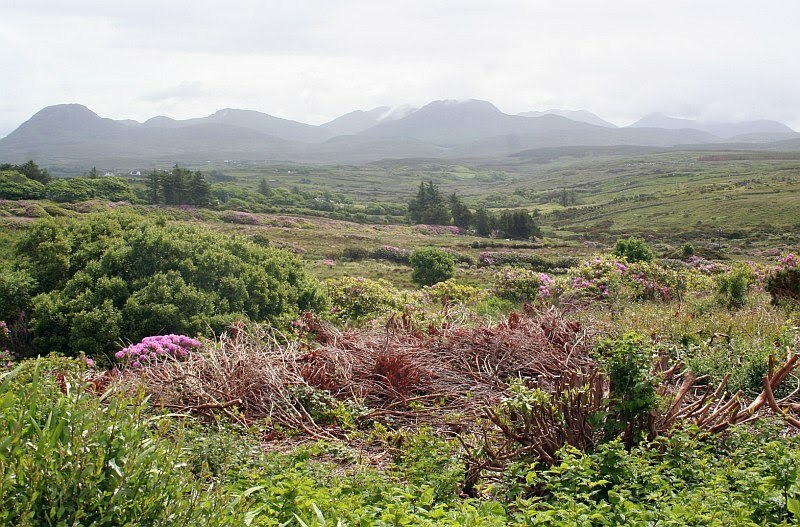 At the head of the fjord was the small town of Leenane, described as 'the gateway to Connemara'. 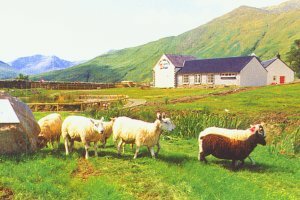 At the Cultural Centre, here was yet another craft shop, specialising in woolen goods and yarns - The Leenane Sheep & Wool Centre. Again, there were some overpriced average paintings for sale, but this time the exhibition in the 'Art Corridor' was lifted by some interesting digital images of collages. At the entrance end was an exhibition area with spinning wheels, examples of natural dyeing processes, and a DVD explaining the history of the local woolen industry. Gille insisted on hearing this in Gaelic, which pissed me off because it was a pointless waste of my time to glean any understanding from it. Instead, I studied the photo's and descriptions of the various breeds that had been cross-bred with the local indigenous sheep. These seemed to look very similar to the Scottish Blackface; I think they call them Mountain Blackface. 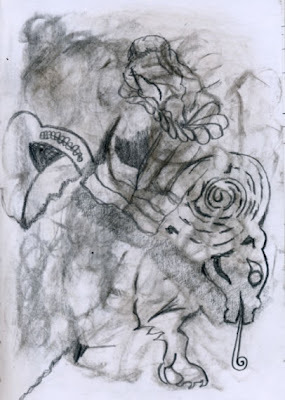 It transpires that the centre is trying to preserve what's left of the original gene pool of the indigenous beast after 500 years of experimental breeding. Back in the main shop area, we got into a stimulating conversation with Orla, sister-in law to Gregg, the centre's manager. She could talk forever and with great passion about any and every aspect of sheep rearing and wool. Time flew by before realising that we needed to be sure about catching a ferry to Clare Island. Two Irish walkers in a Irish forest saw a large hole in the undergrowth. It was so deep they couldn't see the bottom, so they looked around for a stone and found a huge rock which they were just able to carry between them. They dropped it into the hole and started to count the passing seconds as they waited for the crash. Suddenly, a sheep came rushing towards them with a fierce look on its face, ran at full speed between the two men and dived straight into the hole. Needless to say the two men were perplexed and just them a farmer came along. They told him that a sheep had just run straight at them and then dived into the hole. "Can't be mine" said the farmer, "My sheep is tied to large rock over there! After following the north side of Killary habour we headed for Louisville, an attractive village which is the nearest settlement to the ferry for Clare Island. 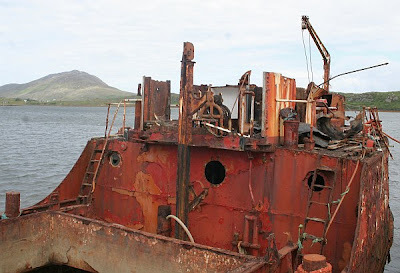 On the way there we were intrigued to see a rusting remains of a small coaster, slightly larger than a Clyde Puffer. This was the last time I was able to use my camera. At Louisville, we found a good coffee house that didn't mind us preparing for the fashion show. Timing was going to be tight. We would only have a couple of hours on the island befor the event was due to start. I volunteered to create a basic setting. Martin rang ahead and asked for some lighting and a promise of some flipchart paper. I scoured the village shops for any art materials, returning with string, marker-pens and sticky tape. I had a go at drawing on a page from my notebook where I'd rubbed in some peat, suggesting some images locked in. I would also use a piece of salt-bleached driftwood that I'd found on a beach. As ready as we would ever be, we parked-up at the ferry and waited to embark. There was a good sea running on the Force 6 westerly. We saw a small craft approaching through the spume, sometimes disappearing from view in the swell. other times encompassed in white spray. This was our ferry. Unable to board from the quay wall because of the swell and the pitching, she was brought alongside a larger ferry, a procedure which saw two strands of the mooring rope snap. We boarded eventually along with other passengers, bikes and the driftwood, and had an exhilarating passage over through fresh white spray.